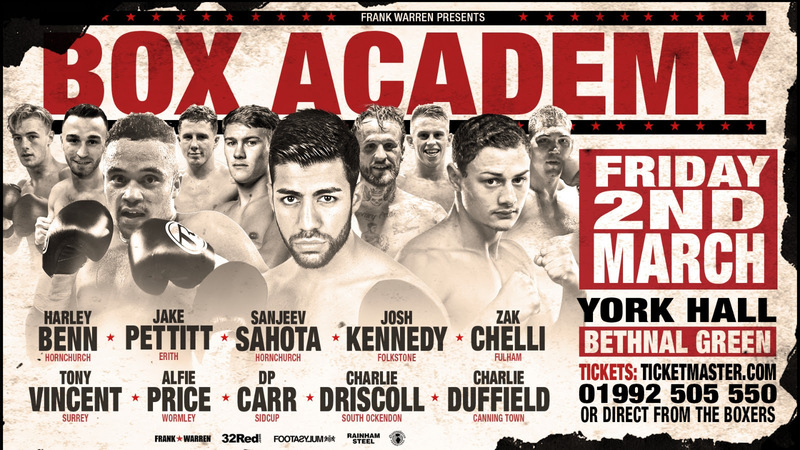 Some of Frank Warren’s brightest young stars are in action at Bethnal Green’s iconic York Hall on Friday 2nd March as part of his stacked Box Academy show. All-action Hornchurch Welterweight Sanjeev Sahota (10-0, 3 KO’s) has enjoyed a rapid rise since turning over in early 2016 and continues to work towards his first professional title. Negotiations for ‘SSS’ to take part in his first title bout on the March 2 card are ongoing. Undefeated English Super-Bantamweight Champion Josh ‘Handsome’ Kennedy (10-0, 5 KO’s) promises to start the year in style as he targets a shot at the British title currently held by Thomas Patrick Ward later in the year. Fulham Super-Middleweight talent Zak Chelli (3-0, 2 KO’s) returns to the atmospheric hall for the first time since his pro debut win against Trowbridge’s Jacob Lucas in February 2017. Hornchurch Super-Middleweight Harley Benn (2-0,1 KO), son of British fight legend Nigel, is gunning for another York Hall KO when he takes on Welshman Gary Cooper over four rounds. Exciting Erith Flyweight Jake Pettitt (2-0) makes his York Hall bow after his impressive points win over Stefan Sashnov on the Billy Joe Saunders v Willie Monroe Jr undercard back in September. Powerful Sidcup Super-Featherweight D.P Carr (8-0, 4 KO’s) tests himself against former Midlands Area Champion and Lyon Woodstock opponent Paul ‘The Incredible’ Holt. South Ockendon Super-Lightweight ‘Champagne’ Charlie Driscoll (5-0) takes part in his first scheduled six rounds contest while the hugely-popular Canning Town Light-Heavyweight Charlie Duffield (4-1, 4 KO’s) faces Stoke’s Chris Nixon over six rounds. Surrey Lightweight Tony Vincent (1-0) fights in the capital for the first time and Wormley Lightweight Alfie Price makes his professional debut against Gloucester’s Andy Harris. Tickets for Box Academy priced at £40, £50, £60 and £80 are available to purchase from www.ticketmaster.com and directly from fighters on the bill.